When it comes to weight loss, a low-carb diet may help you lose faster and keep it off better than a low-fat diet, according to a 2008 study published in the New England Journal of Medicine. If you're considering a low-carb diet to lose weight, you'll need to know what you're allowed to eat to see if it's a good fit for you. Consult with a registered dietitian if unsure about translating your food list into meals. Meat, poultry, fish, seafood and eggs are virtually carb-free and are a major part of the low-carb food list. The exceptions include those with added sweeteners such as honey-glazed turkey or fillers found in some sausages and lunch meats. 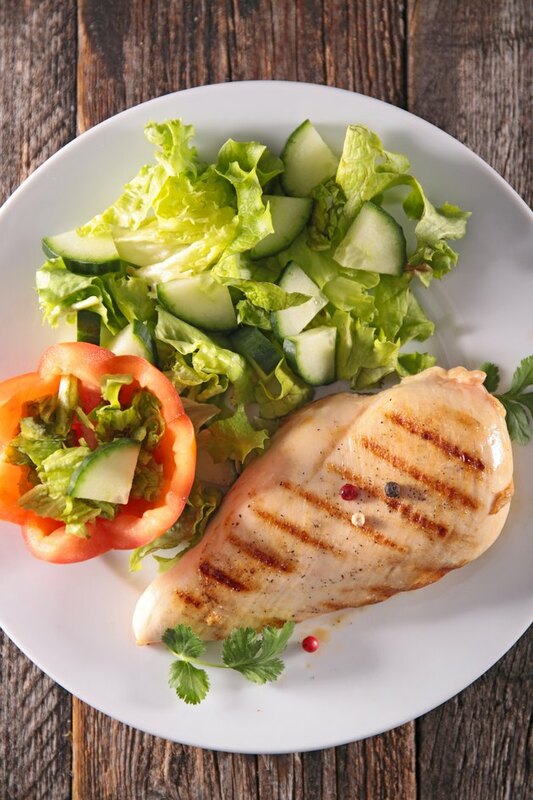 To avoid hidden carbs, include mostly fresh animal proteins such as chicken, turkey, fish, shellfish, beef and pork. With eggs, use heavy cream instead of milk when scrambling, or eat them hard-cooked, fried or poached. Tofu is a low-carb vegetarian protein you can include on your weight-loss diet. A 1/2-cup serving of firm tofu has 3 grams of carbs. In addition to meat, veggies are an important part of your low-carb weight-loss diet. Although not carb-free like meat, non-starchy vegetables are low in net carbs -- which are grams of total carbs minus grams of fiber -- plus rich in nutrients your body needs for good health. Veggies with less than 1 gram of net carbs per 1/2 cup include radishes, celery, endive, escarole, spinach, lettuce and bok choy. If you're on a very low-carb diet -- less than 50 grams a day -- these veggies can help fill you without going over your carb limit. Broccoli, cauliflower, asparagus, cabbage, cucumbers, peppers, jicama, raw tomatoes, eggplant, spaghetti squash and Brussels sprouts also fit, with 5 or fewer grams of carbs per 1/2-cup serving. Milk and yogurt aren't carb-free, but you can add cheese to your food list. Most cheese contains a small amount of carbohydrate, so you'll need to read the food label to keep yourself on track. Cheeses with less than 1 carb gram per ounce include cheddar, goat, mozzarella, Gouda and Parmesan. Cream cheese and blue cheese also have less than 1 gram, but the serving size is 2 tablespoons. Swiss and feta each have 1 carb gram per ounce and cream cheese -- although more a condiment -- has less than 1 gram per 2-tablespoon serving. Most of the calories in fruits come from carbs, but that doesn't mean you should avoid them on your low-carb diet, especially if you're not too carb-restricted. Like the low-carb veggies, lower-carb fruits are rich in nutrients, making them a healthy part of your weight-loss diet. Half of an avocado, 1/2 cup of pumpkin or five olives each have less than 5 grams of carbs. For less than 7 grams of carbs, add 1/2 cup of fresh raspberries or sliced strawberries to your list. You might also be able to fit a small orange or peach into your plan, which will only cost you 11 or 12 grams of carbs. One-half cup of fresh blueberries also has 12 grams of carbs. Butter, olive oil, walnut oil and other vegetable oils are all carb-free and make good fats to add to your low-carb weight-loss food list. Nuts aren't carb-free, but make a healthy addition. Pecans and macadamia nuts, with 4 grams of carbs per ounce, make an especially good choice, while almonds have 6 carb grams in an ounce. Use herbs and spices to add flavor to your food without upping the carbs. Good choices include basil, oregano, pepper, garlic, cilantro, dill, sage and rosemary. Also good are red wine vinegar, which has zero carbs, or balsamic vinegar, which has 3 grams of carbs per tablespoon. Artificial sweeteners such as sucralose, stevia and saccharin each have 1 gram of carbohydrate per packet. Atkins: What Are Net Carbs? How Can You Do Low-Carb and Weight Watchers at the Same Time?